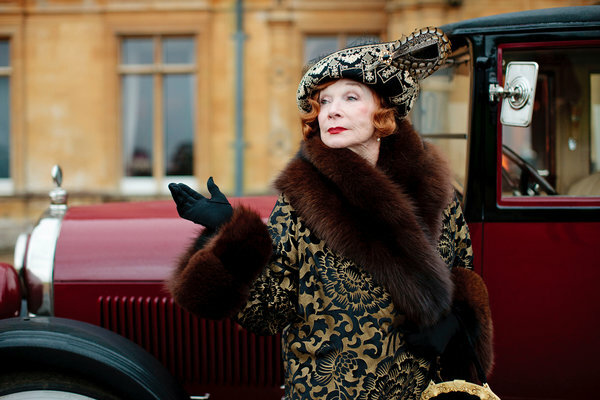 Downton Abbey: Television for the Internet Age? I love Downton Abbey. It hits a sweet spot of mindless pleasure for me. Yes, it’s really just a British-accented Days of our Lives, but it’s wonderfully acted, soothingly English, and with a few nice clever twists. In honor of the US premiere of the third season last night, I thought I’d bring my interest in things digital to bear on Downton Abby. “How?” you might ask. It all starts with Shirley MacLaine. Shirley MacLaine, who joined the cast for the third season (already aired in the UK but just now airing in the US), was recently interviewed by the New York Times about why she thinks the show has captured the devotion of so many. As most of you probably know, it’s been a huge, surprise international hit. If I have my stats right, it’s one of the biggest BBC shows ever. Q. What about the show hooked you in? A. I realized that Julian [Fellowes, the “Downton Abbey” creator and producer] had either purposely or inadvertently stumbled on a formula for quality television in the Internet age. Which means there are, what, 15 or so lives and subplots, with which not too much time is spent so you don’t get bored, but enough time is spent so you are vitally interested. This comment alludes to an idea that we’re all familiar with – because we’re constantly multitasking and skimming huge amounts of information in a superficial way in order to wade through our daily information overload, we have developed a preference for short snippets of entertainment rather than more in-depth (read intelligent/complex) material. We just don’t have the patience or bandwidth anymore for anything longer or more involved. I think linking up the popularity of Downton Abbey with this notion is an interesting idea. Of course, I have no basis upon which to say whether Ms. MacLaine is right or wrong, but my instinct is that she is not quite right. Although it’s hard to avoid the conclusion that much of our entertainment has evolved towards less depth and more superficiality over the past decades, this drift towards the superficial precedes the internet age. Soap operas have been popular for a long time. Reality television was a well-entrenched phenomenon before the dominance of mobile devices made multi-tasking a daily reality. And come on now; look at the TV shows from the 1950s or 1960s: Not exactly sophisticated material across the board. How much have we actually drifted towards the superficial? Maybe we’ve just always been here. So, for me, this explanation doesn’t hit the mark. However, another way to interpret Ms. MacLaine’s comment is that we love having “15 or more subplots” (to avoid getting bored) simply because we enjoy multitasking. It’s not that we CAN’T focus our attention for a long period of time. We just don’t like to. Perhaps we prefer shifting our attention because it feels better/easier/more familiar to divide our attention among several things. Perhaps we just want to have it all. In illustration, yesterday, I showed my four-year-old son Kavi a picture (on my iPad) of some of his friends. He liked it a lot but there was something about it he didn’t totally understand (it was a joke picture). Whatever the case, he thought “it was cool.” His dad, Vivek Tiwary, and he were having a little boys’ time watching Tintin, so I started to walk away with the picture. He completely balked at that claiming he wanted to look at the picture and watch Tintin at the same time. I asked him how he’d do that, why he would want to do that, etc,…. No coherent answers were forthcoming except his claim that “it’s better this way.” And indeed, he proceeded to watch the movie, glance down at the picture on my iPad, watch the picture, glance down….for the next several minutes. He seemed to be enjoying himself. He seemed to feel it was better this way. For me, the take-home message here was that for my little guy, more was just better. Maybe that’s the secret of Downton Abbey as well: it’s just a whole lot of whatever it is that makes it special.